Dad and I are taking the Joy Dare. It's a "dare to live fully right where you are". We're using the "One Thousand Gifts Journal" by Ann Voskamp to help us out, and by counting three gifts from God each day, we're going to find one thousand of them in a year. It's my new plan to try and open my eyes to the graces of God that surround me each and every day, even in the mundane. We started Monday, and I can tell I haven't made this a practice yet. There's a few difficulties that I've noticed right off the bat. First, I'm not good at even remembering to keep looking for the ways God shows me He loves me through the day. Second, when I do remember to keep my eyes open, I'm not very good at recognizing His gifts yet. On her blog, Ann frequently says, "All is grace." This is clearly something I need to work on seeing. I know I've kind of disappeared a bit this week. Don't worry. I haven't gone back to my Candy Crush addiction. The older two kids have been at my parents' since Monday, and Tim fantastically allowed me to sleep in for a couple of days. It's amazing how much of a different two and a half hours of sleep makes. I have now joined the kids here for a few days, so I don't know that my posting will be any more frequent while we're here. I don't really have anything more profound to say than that. The downfall to taking a few days break is I've also let my brain shut down a bit, so I haven't been pondering any blog posts throughout the day. I've got a bit of blog reading to catch up on, and maybe that will lend itself to some inspiration for another day. The storms on Friday night were pretty spectacular. I can't remember the last time we had a good storm like that come through while I was awake to see it. We stood on the front porch watching the lightning for quite a while. I remember thinking, "Isn't God awesome?" And for a few moments, I pondered how the storm showed God's strength and might in a way we don't see very often, and I found myself filled with such a sense of peace. How odd it was, standing there with the lightning flashing and the thunder booming all around, feeling a peace I don't often feel these days. It's made me think a bit how storms in life do not always cause us to do the same thing - realize God's strength. Through nature's storm, I saw God's power, and I realized how small I am, but knowing that He was (and is) in control, I felt peace. Why can't I do the same thing with the storms in life, with the storms within myself? 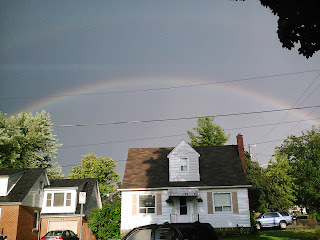 Perhaps this is the lesson to be learned, that when I have storms in life, I need to remember God's strength, that He is in control, and in so remembering, I will feel that elusive peace. And maybe that is part of the purpose of storms, to remind us that God is in control, to remind us how small we are and how much we need Him. 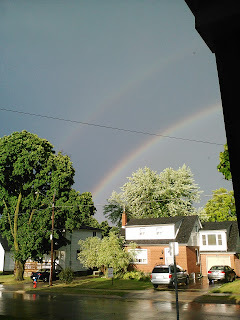 ...extra reminders in the pause between storms that God promises to be faithful. Spread the mixture evenly onto a plate. 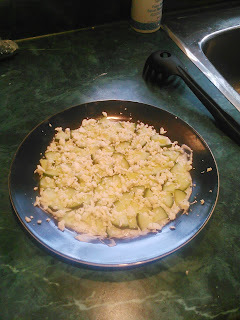 Chop up a bunch of cucumbers into small pieces and lay them on a piece of paper towel. Blot dry. 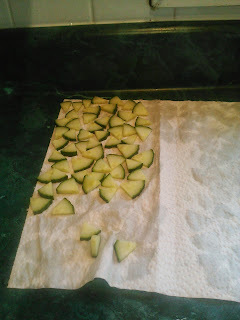 I usually fill the one side of the paper towel and fold it over to dry them off, and that's about as much cucumber as I need. Spread the cucumber evenly over the mixture on the plate. 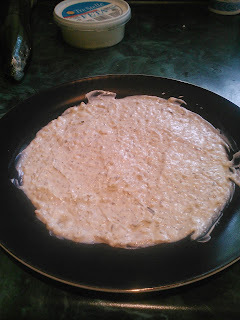 You can be finicky and put every one just so (like me) or you can just sprinkle them and let them lay where they fall. Crumble some feta on top. I usually eat these with regular chips, but apparently you can also use tortilla chips if you prefer. And there you have it. 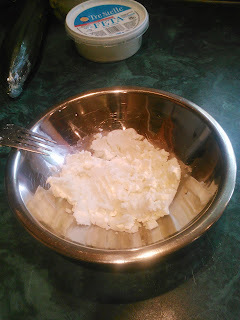 The original recipe called for a clove of garlic to be added to the goat cheese mixture, but the one time I tried it that way I didn't like it at all, so I leave it out now. If you try it, let me know what you think! It's early enough that the sky is still gray, and I play the guessing game of if it might rain today or if it's just too soon to tell. Turns out it was just too soon to tell. Now that my coffee is done, and I sit down to read and write, I can see tiny clouds in the sky tinged pink with the colour of the sun rising. Not the heavy rain clouds I was hoping for to break this ridiculous heat. And I try to find little things to be thankful for so that I don't start the day out grumpy. Like that I didn't have to wake up in the night for the other kids, just Nathan. And even if it doesn't rain, at least it looks to be a bit windy outside today. Two of the blogs I read in the mornings had posts today about having crummy days and just wanting to run away. I could relate a little too easily. It feels like it's been a long stretch of crummy days lately, and I'm getting a little tired of it. The exhaustion is wearing me thin. And then I feel guilty that my complaint is that I just need more sleep (because I think that's what it is), and I wonder why I can't be happier about the rest of life because when I look at the ways God has blessed me, He is so good and faithful. It is ridiculous how lack of sleep changes your perspective on everything. This daily struggle to find joy, this daily struggle to see His grace forgiving me each and every time I lose my temper - oh people, how I struggle! My heart echos Psalm 77:7-9, "Will the Lord reject forever? Will He never show his favor again? Has His unfailing love vanished forever? Has His promise failed for all time? Has God forgotten to be merciful? Has He in anger withheld His compassion?" Will I be sleep-deprived forever?? And of course, the answer is No. But there is such a difference between knowing that this too shall pass and having it actually pass. Anyway, that's where life is at, people. I don't want pity or sympathy. Maybe just some prayers. And if any of you might be experiencing some of this too, you can know that you're not alone. Happiness is sitting on the couch beside the open window and breathing in the smell of summer washing over me. How do I hold on to this moment forever? For once, this brief instance of time, I feel peace. I could sit here forever. Would it be wrong if I let the kids watch TV all day just so I can sit here and enjoy this? I look out at the big tree in my front yard, and the scent of nature fills my senses, and I'm transported to memories of campsites and being outdoors, and suddenly, I can't wait until August and the camping trip we have planned. And I wish we could make houses out of trees, real trees, and that we could live in nature constantly so I could always feel this peace because how can you feel anything but that when you are surrounded by God's creation? Of course, I know this is unrealistic. Winter comes with its harsh cold winds and biting snow, and on those hot humid sticky summer days, I'm pretty thankful to come indoors to my air conditioning. But today, just today, I cling to this. I breathe deeply. In. Out. In again. Out again. This is right. This is good. Thank you God. It's been about a week since I made the decision to stop playing Candy Crush in the mornings and go back to starting my day by reading and writing blogs. I'd have to say that so far, I've been pretty successful. Clearly, I've been posting more regularly. (Yay!) My phone sits untouched on the table or the counter for the majority of my morning, and I'm not starting my day zoned out and focused on a game. This is not to say that I never play Candy Crush ever. I still play on random occasions throughout the day when the kids don't require my attention, and I've got a quick minute to take a little break, and there was that one day where naptime totally sucked, and I was exhausted and just needed to escape, so I gave myself permission to zone out and use all five of my lives in one sitting. But otherwise, I've been good at limiting my time on the phone, and I think we're all happier for it. I feel like my brain is more engaged again. I'm back to going through the day thinking up random phrases that I can turn into blog posts. I forget most of them in my perpetual state of exhaustion, but at least I'm thinking them to begin with. Sometimes I wake up at 3am after sleeping solidly for four and a half hours thinking to myself, "Wow. So that's what it feels like to get a decent chunk of sleep for a change." And then sometimes, I finally roll out of bed at 6:30 feeling no different or more rested because I had to spend over two hours after waking up at 3am trying to get Nathan back to sleep. Sometimes I get angry at my one-year-old when he doesn't go back to sleep after I feed him in the middle of the night. Sometimes I get angry at God for not doing more to help that one-year-old get back to sleep so I can get more sleep and not be so tired all the time. Sometimes I remember when Jesus said, "In this world you will have troubles, but take heart. I have have overcome the world." Sometimes I remember that He doesn't promise to take away our trials, but He does promise to be with us through them. And sometimes I forget. Usually, those sometimes when I forget is the sometimes when I get angry. Sometimes I need to be reminded that God forgives me anyway. Sometimes He sends little messages to encourage me. Sometimes it helps. Sometimes I need to hear more before it sinks in. Sometimes I wish I could just go back to remembering what it felt like to get a solid chunk of sleep. 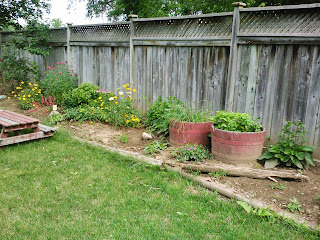 It's finally time for the long awaited post with the update on my garden. I went around the yard yesterday and took pictures with my phone because I finally figured out how to upload from my phone to my blog. I'm very happy as this significantly simplifies the whole picture upload process and makes this post much easier to do. 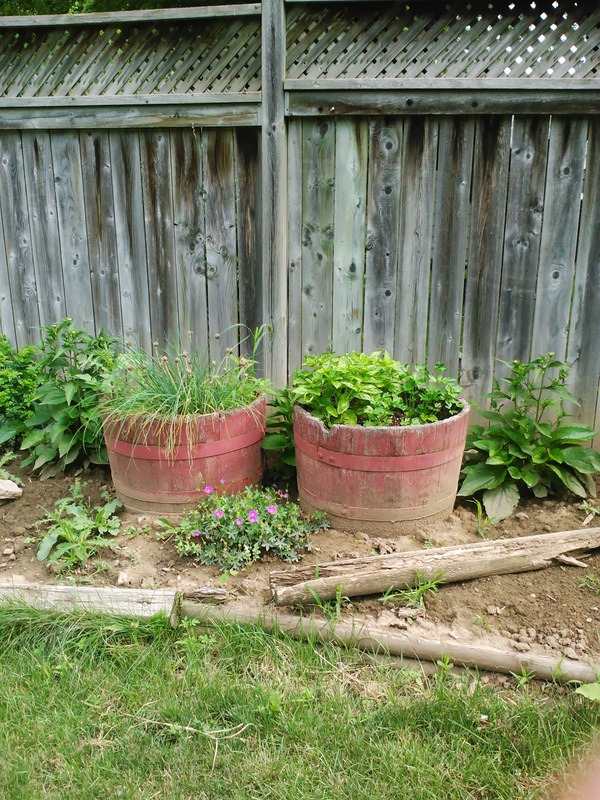 Here are my herb barrels. 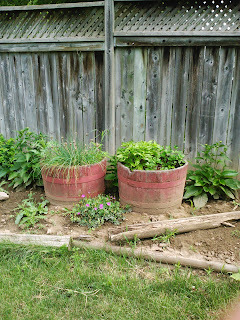 In the left barrel are chives and in the right are basil and parsley. I'm actually not super thrilled with my basil this year. I think it's a different variety than I had last year, and I didn't care for the taste as much when I put it into a salad last week. There are black-eyed susans on either side of the barrels and one tucked in behind that you can't really see. My hope is that they will fill in all around the barrels. I can't remember the name of the purple flower in front. 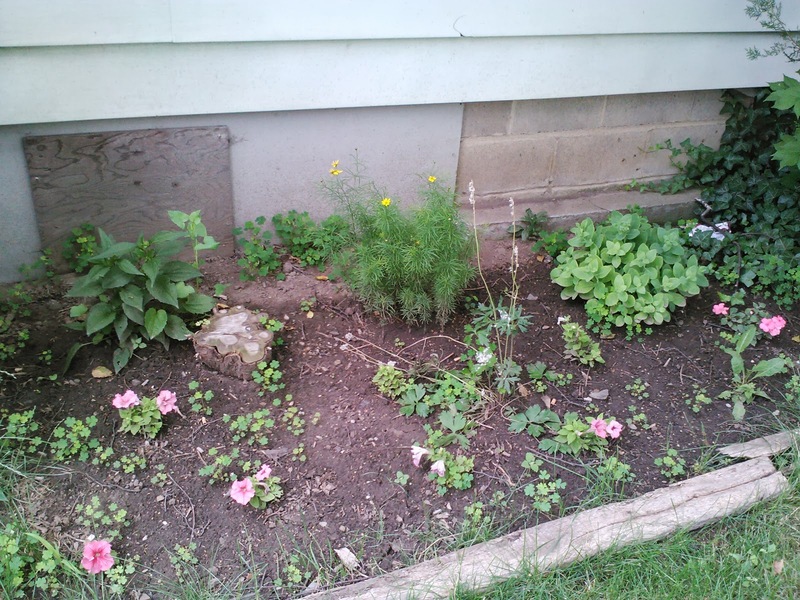 Here we have some coreopsis and coral bells from Aunt Amy, and some daisies and echinacea (cone flower) from Dad, plus a bush and some ivy that was already there. 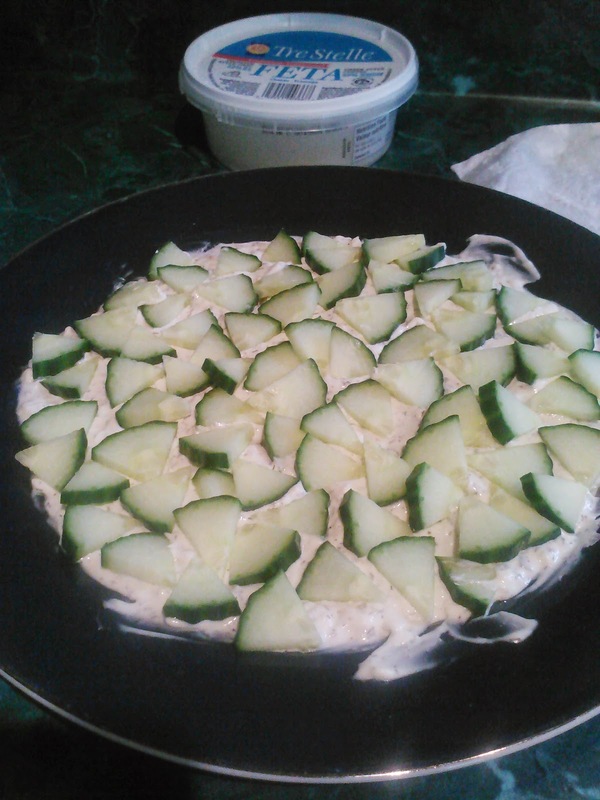 The picture's a bit small, so they're not easy to see, but they're there. I need to find something to fill in front yet. It's a bit of a chore keeping the bushes from not completely taking over, and I need to be very on top of the ivy as well, but when they're kept in check, they have a nice look to them. 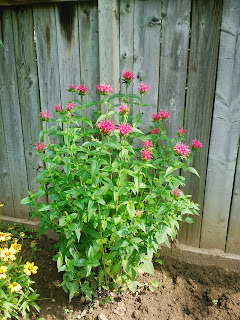 This is a pink bee balm (I think) from Aunt Amy. It just bloomed this past weekend, and it's quite lovely. This is my hosta garden with a bleeding heart thrown in. This corner is almost completely full shade, hence the choices here. 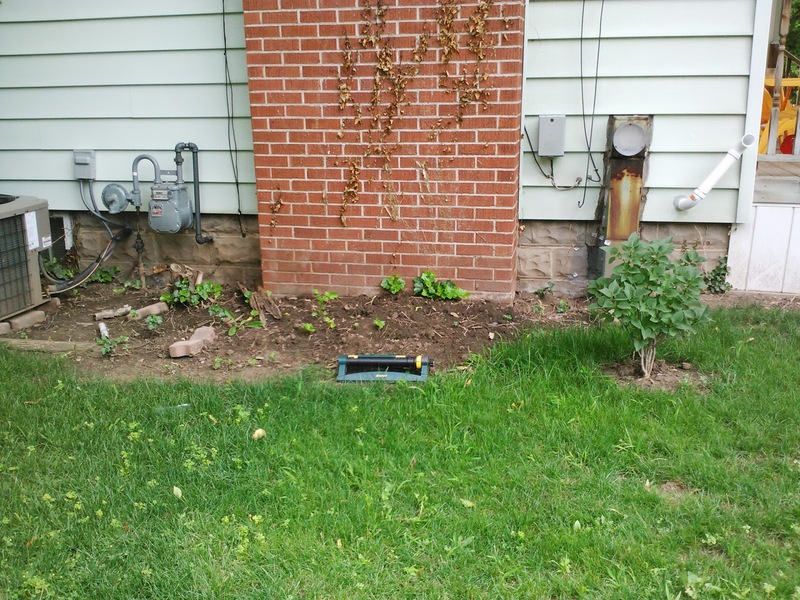 You can't really see them very well right now, but there are a few lily of the valley plants thrown in the mix as well to fill in some of the gaps. 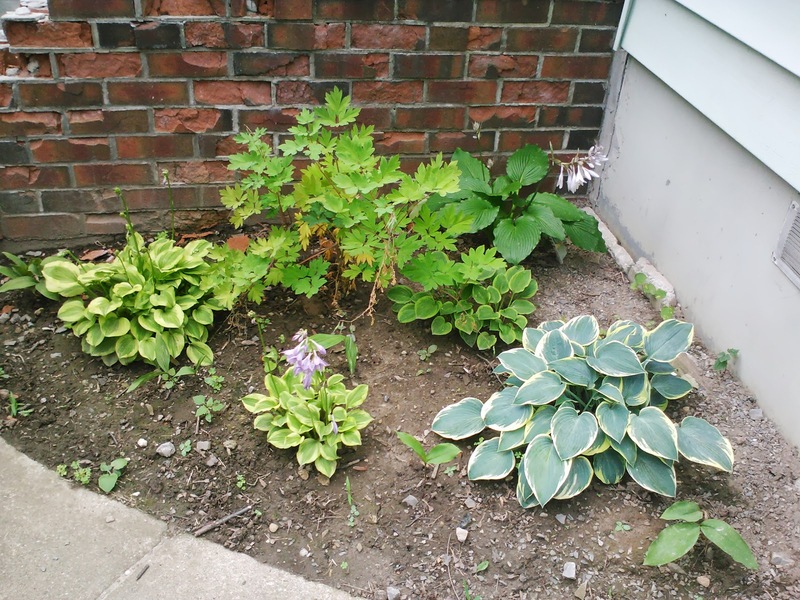 The hostas are now blooming, and I'm quite happy with how this garden has turned out. 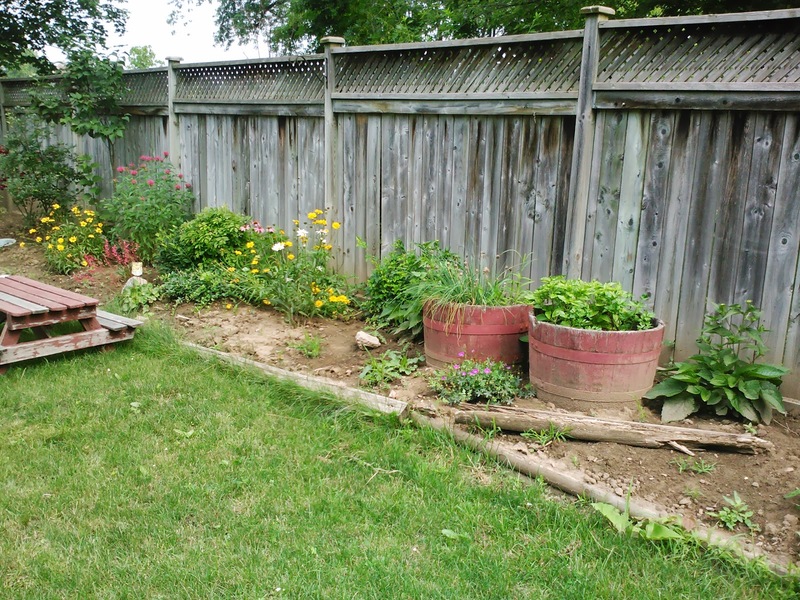 The gardens beside the house continue to be a bit of a work in progress. We've cleaned up the ivy off the chimney and from the garden in front of it. There used to be a spruce on the corner in front of the ugly furnace vent. I've put in a lilac there instead, but it's still a bit too small to fully block the ugliness. Hopefully we can just replace that at some point. 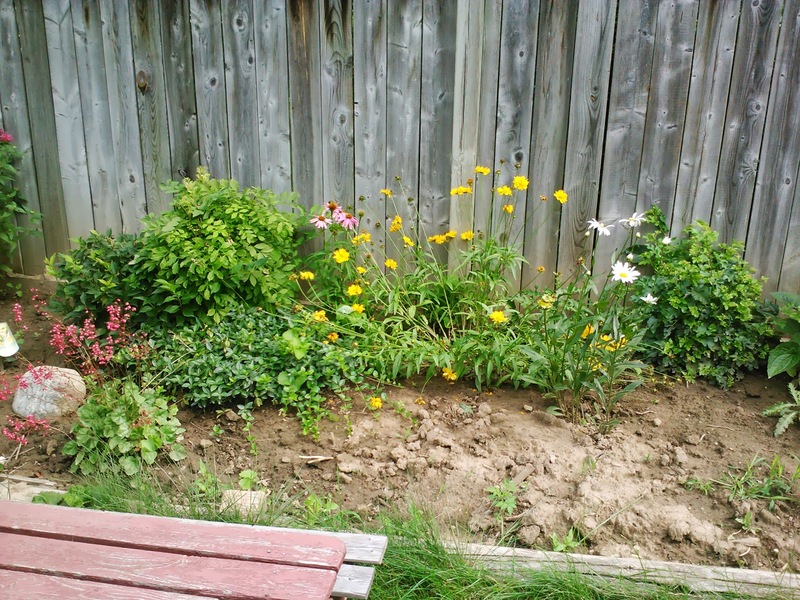 Here's a bit more of the side garden, the part right next to the gate. Apparently it could use a bit of weeding... 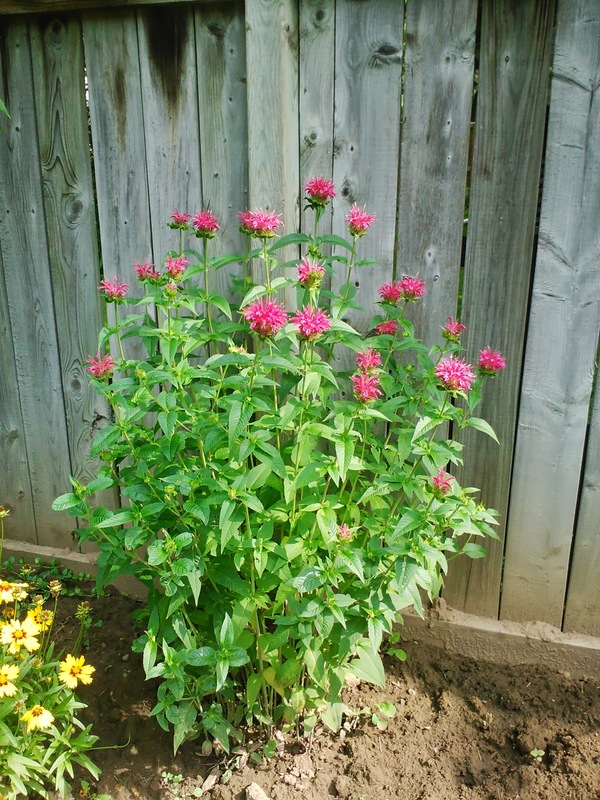 There's some red bee balm on the top left. 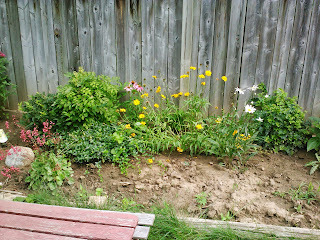 Next to it with the tiny yellow flowers is a different variety of coreopsis from Dad. Then a sedum which is probably in the wrong spot. I think it would prefer a bit more sun or something because I can't get the darn things to bloom if my life depended on it. 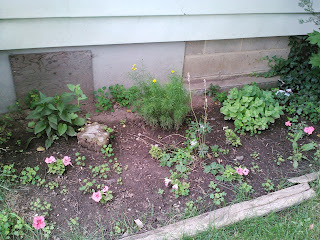 You can't see it well, but there's also an anemone flower a bit in front of the coreopsis. 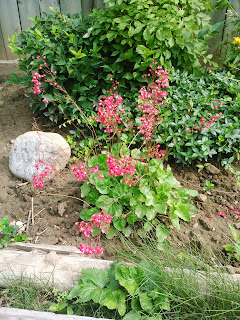 It bloomed quite nice earlier in spring. I filled in some of the holes with some spare annuals, but they should also be in a bit more full sun area. Oh well. Last but not least, here's a shot of the big tree garden in the front yard. 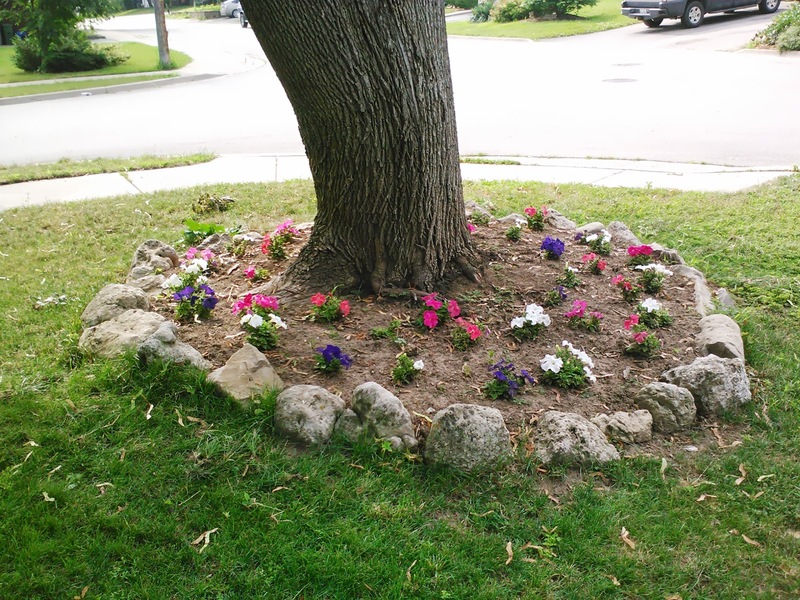 I put in all petunias this year, and it looks quite nice at the taking of this picture. A week ago I wasn't too sure how it would turn out as it appeared that our friendly neighbourhood rabbits were enjoying the taste of them, but some deadheading and significant watering later, and they appear to be picking up. I'm hoping the whole thing fills in, but we'll see. When Nathan woke me up before 5:30am, I was actually almost looking forward to getting up and blogging this morning. I think progress is being made in the right direction here. So I thought I'd let you know some of the strategies I'm using to help myself get through my Candy Crush addiction and engage with my world. 1 - Plan my mornings. What this looks like for me: either at night as I'm falling asleep (which takes me a ridiculous amount of time even though I'm exhausted) or first thing in the morning after Nathan wakes me up and I lay there praying for him to fall back asleep, I think to myself, "What am I going to do this morning?" And the answer isn't allowed to be, "I'm going to sit and play Candy Crush until the kids scream at me because they want breakfast." I tell myself that I'm going to sit in the kitchen with my laptop and read some blogs. Sometimes I think about what post I might write that morning. And I remember that every day starts with coffee. Precious, precious coffee. It's time to buy another package of the flavoured stuff to give myself that added bonus of an extra good cup. 2 - I deleted all my extra lives in Candy Crush. See, Candy Crush has this thing where you need lives to play a level. If you don't beat the level, you lose a life. But you're limited to five lives, and then you don't get more for a set amount of time. I think it's something like half an hour to the next new life. But you can give your friends lives when you connect to Facebook. I had collected quite a few - as in, like, 40 spare lives waiting to be claimed. Which meant that I could play any time I wanted, and I wasn't limited by not having any lives to use. Well, I deleted my extra lives, so I'm back to being limited to five lives at a time. 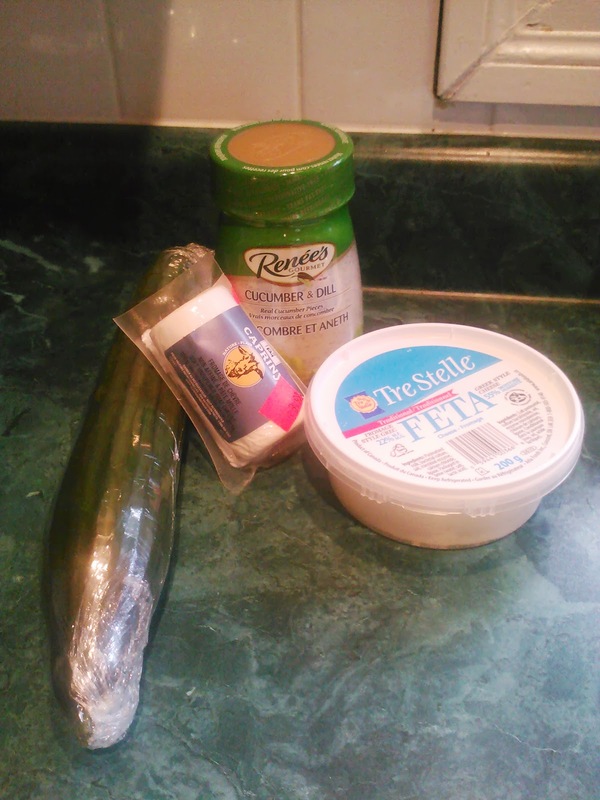 3 - I made a list of all the OTHER things I can do with my time. Normal things like cleaning and gardening and actually putting the laundry away instead of just leaving it clean and folded in the basket. The point is that when I'm feeling bored and wanting to escape, I can go to my list and find something productive to do instead of just turning to my phone. Those are the three main things I've been doing in my attempt to spend less time on my phone. So far, so good. I've got a couple more ideas for blog posts to come, so hopefully this new morning routine will allow that to continue as well. For now, I haven't had my coffee yet, so I'm off to go pour a cup before I try to say too much more, and it comes out completely incomprehensible because my brain isn't completely awake yet. I'm trying to get back into my morning routine of starting the day by reading blogs and doing some of my own writing again. If this works out, I might actually manage to post more regularly like I keep saying I'm going to do and never actually keep doing. So today, I'm announcing my intention to change that up and go back to what I did back before I got pregnant with Nathan and had to deal with morning sickness and exhaustion and then he was born and my mornings just got crazy trying to deal with an infant and two other kids, one of whom needed to be on a bus three days a week at 8 o'clock, and I was still exhausted because of lack of sleep -- and really, that hasn't changed -- but I need to do SOMETHING other than being a tired zombie playing on my phone. I don't want my children to remember me as the mom who was always on her phone. Maybe being on my laptop isn't much of a change, but it sure is a heck of a lot more productive, and for some reason I don't feel quite as zoned out when I'm reading blogs and writing. My brain is more engaged, and it's not quite as frustrating when I get interrupted. My name is Marleah, and I'm addicted to Candy Crush. But I'm not going to let a game take me away from engaging in my real life. So I'm putting the phone down in the mornings, and I'm going back to a routine that worked well for me. Boo-yah.